The Radial Workhorse is a modular rack and mixer that combines the popular 500 series platform with an incredibly flexible patching system to let you create the ultimate studio environment. Equipped to handle up to eight modules, the Workhorse lets you mix and match preamps, EQs and compressors and bring them all together in one rack. Individual modules may be accessed on the rear panel following the traditional API format or bussed to the built-in 8x2 summing mixer for left-right signal panning, level control and muting. Once mounted, a unique 'feed' functon lets you configure modules to feed one another in series to create the channel strip of your dreams! The master section features a traditional virtual ground mix buss combined with the superb sonic performance of Jensen Transformers on the main mix outs. A separate stereo monitor output provides playback, plus a super-loud dual-output headphone amp lets the engineer share the mix with the artist. Multiple Workhorses may be ganged together using the expansion buss to build 16, 24 or even 32 channel systems. Rear panel connectivity is extensive: Each channel is equipped with traditional XLR input and output. This is augmented with ¼" TRS jacks for balanced or unbalanced connectivity. A special Omniport jack delivers module-specific functionality that can range from an extra output, ducking input or effects insert depending on the module design. The Workhorse comes ProTools-ready with 8-channel D-subs for the inputs and outputs plus third D-Sub gives you access to the built-in summing mixer for those that prefer the added warmth of analogue summing. Powering concerns are addressed with a unique 'pooled' supply that shares 1200 milliamps of current between the available 8 slots. This allows high current demand modules to exceed the usual limitations of other 500 series racks without the worry of brown outs. Plug and play easy to use, the Workhorse brings the fun, excitement and creative advantage of warm-sounding analogue to the modern \ digital studio. 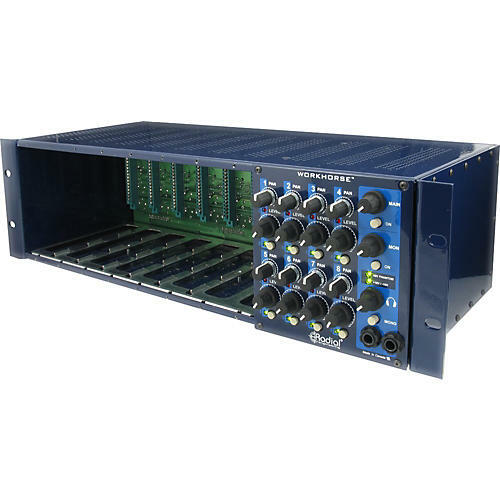 Designed to fit inside a standard 19" rack, the Radial Workhorse allows up to eight 500 series modules to be loaded at any one time and connected to the back-plane via a 15 pin card-edge connector. Each module access port is equipped with independent inputs and outputs following the original API specification and is augmented with an internal mix buss for stereo recording. Cusotmize a recording system for your needs!